Semi-flexible Level III-A for pistol and 9mm sub-machine-gun protection. multiple MOLLE webbing on the Body Side for gear anid ammo pouches, etc., etc. Level III-A is flexible to make it easier to maneuver through doorways and tight spaces than a rigid shield. Can be bent over in half for transport. Made-to-order, and shipped in 3 to 6 weeks. Add a Level III+ or Level IV Rifle Plate. e.g., 10" by 12" or 11" by 14". 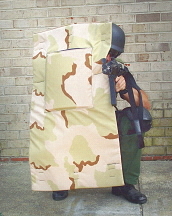 You can order from us, or use your own, but MANDATORY for blunt trauma protection of the shield arm.